A cancer cell is said to metastasize when it moves locations in the body. The ability of a cancer to metastasize is dangerous for an organism, as it can establish smaller tumors that may not present symptoms until long after the first tumor has been removed and treated. Several genetic changes must occur to a regular cell for it to become cancerous. The cell must lose the ability to regulate growth, must ignore bodily signals that call for the cell to stop dividing or die, and also must lose or stop producing the proteins and structures that hold the cell in place. The difference between benign and malignant tumors is the ability of the cells to metastasize. Benign tumors, while they represent a health threat if left untreated, do not have the ability to metastasize. Malignant tumors have several special mutations that allow cells to metastasize. The first is the production of extra growth factors. Growth factors are molecules that attract certain tissues and cause them to grow. Large production of these growth factors can lead to other parts of the body swelling. The second mutation giving cancer cells the ability to metastasize is angiogenesis, or the ability to grow blood vessels. Malignant tumors with this ability can secrete special chemicals, which attract the growth of blood vessels. Thus, the tumor can receive oxygen and nutrients from the body. Even cells in the interior of the tumor can be next to a blood vessel, giving them greater opportunity to metastasize into different parts of the body. Cancerous cells also have an ability to detach from the main tumor mass, which can lead to the cells spreading cancerous tumors throughout the body. While the previous two conditions are usually required for cells to metastasize from a tumor, the loss of connective structure between cells directly leads to cancerous cells detaching from the main cell mass. 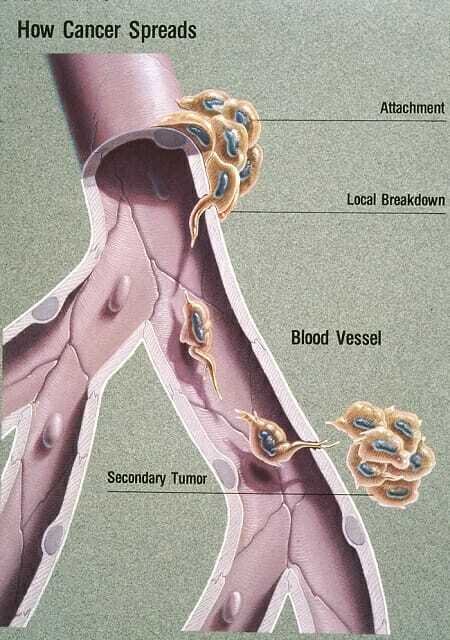 In the graphic below, a cancerous tumor is seen moving through blood vessels and establishing a new tumor. To actually metastasize, the cancerous cells must not only detach from the tumor, but must travel through the blood or lymph vessels to another part of the body. The first step in traveling to another part of the organism is destroying the basement membrane. The basement membrane separates tumors from blood vessels, and must be destroyed for the cells to metastasize. Cancer cells typically produce high amount of a protein destroying enzyme which is secreted onto the basement membrane. The cells can the use an invadopodium to secrete these proteins and push through the membrane. Once through the membrane, the cell must follow signals given off by cells close to the blood vessels to work their way to their bloodstream. The invadopodium then work their way through cells of the blood vessels and enter the blood. To fully metastasize the cells must travel through the bloodstream, exit the blood vessel, and establish a new tumor. However, many obstacles still lie in the way of a cell that is trying to metastasize. Once in the bloodstream, for example, the cells have a high likelihood of being destroyed. To form a new colony, the cells must survive and exit the bloodstream in an area with lots of blood vessels and new cell growth. Without a flow of oxygen and nutrients the cell will not be able to divide and establish a new tumor. The odds against a cancer being able to metastasize to a new area are low, but vary by cancer. Somewhere near 1 in 10,000 cells will be able to successfully metastasize and form new tissues once released from the primary tumor. Cancer – A malignant tumor, with the ability to grow new blood vessels and metastasize. Tumor – An abnormal growth of cells. Benign – A tumor that does not have the ability to metastasize, because the cells are still firmly bonded together. Malignant – A tumor with the ability to metastasize, due to the loss of cell structures that hold tissues firm. 1. A patient is told that they have an “abnormal growth”, and that further testing must be done to confirm what it is. The patient begins to worry, what do you say to calm them down? A. Growths can be many things, few of which are cancerous or lethal. B. You either have a benign tumor, or cancer. C. Doctors don’t know what they’re talking about. A is correct. Doctors do know what they’re talking about, which is a good reason you shouldn’t be nervous. There are a large number of things that can cause an abnormal growth, only some of which have to do with genetic mutations. Many growths are due to developmental abnormalities, and do not present a serious threat. Although they might not know it, many people may harbor parts of resorbed twins that didn’t survive pregnancy. Other growths can be due to acute exposure to various toxins, which can be corrected when the toxin is identified. Due to the low ability of cancer to metastasize, cancers that are caught early can often be treated successfully. 2. While preforming a surgery, a doctor accidently cuts a small benign tumor. A small group of cells from the tumor attached to the scalpel, and is deposited in a different area of the body. Did the cells metastasize? A. No, they were simply transferred, but are still benign. B. Yes, and they should now be considered malignant. C. Yes, but the small transplanted tumor is still benign. A is correct. The cells did not metastasize. Metastasis is a complex cellular process that involves genetic changes in cancer cells. The cells must produce higher amounts of certain chemicals, break down multiple cellular barriers, and travel through a vessel. A benign tumor transplanted to a new area would remain benign. If the small benign tumor was transferred to an area rich in blood vessels and growth factors, it may be encouraged to multiply. Over time, the tumor could cause problems due to its size, or may further mutate into a malignant tumor. 3. Blood cells maintain no connections with other blood cells. Why do these cells not metastasize to different parts of the body, and leave the bloodstream? A. They do, but an equal number migrate back into the bloodstream. B. They do not secrete the enzymes required to dissolve basement membranes. C. They form extracellular connections with the plasma liquid in the blood. B is correct. Cancerous cells form special appendages, invadopodium, which are able to push and digest their way through various membranes and tissues. Blood cells are typically simple, and only contain structures to carry oxygen. Certain cancerous do affect blood cells, however, and these cancers can then metastasize to different tissues. They must first mutate several times, to become much less like blood cells.